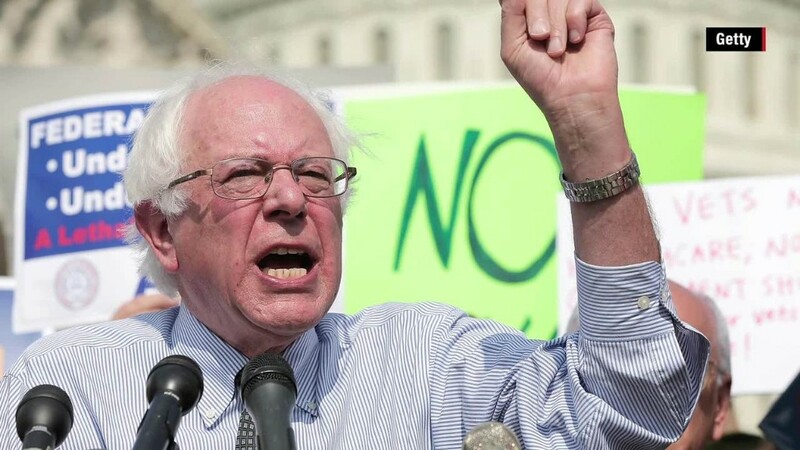 Democratic presidential hopeful Bernie Sanders positions himself as the champion of the little guy. In his stump speeches, he's fond of saying: "The average American is working longer hours for lower wages." He's tapping into the deep unease that still exists about the American economy. Despite the country's low unemployment rate (5.3%), too many people aren't getting ahead. The typical U.S. household takes home about $52,000 a year -- almost exactly what they made in 1995. But are people really working more than their parents and grandparents did? At first blush, Sanders seems wrong. 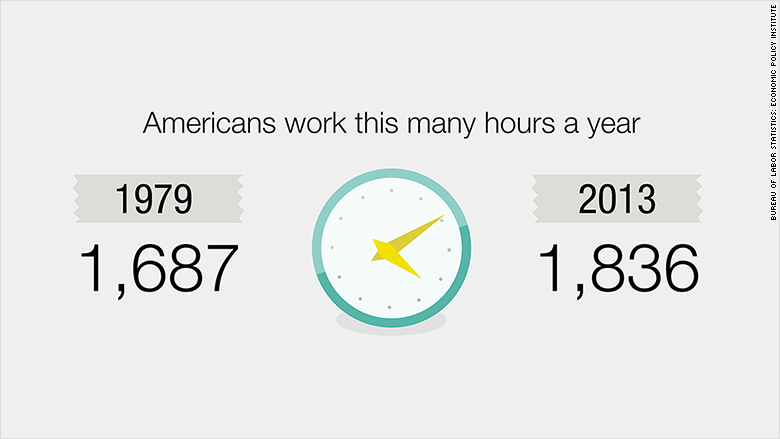 Americans have worked about the same number of hours a week -- 39 hours -- since World War II, according to government data. It's why we have so many songs and jokes about the "40 hour work week for a livin'." But dig a little deeper, and Sanders' claim isn't so outlandish. It turns out, Americans are logging more weeks of work a year now that they did in the past, according to research from the Labor Department. In 1979, people were working for 1,687 hours a year. By 2013, that figure had jumped to an average of 1,836 hours a year, according to an analysis of government data by the Economic Policy Institute, a left-leaning think tank. It's tempting to think that Americans today are taking a lot less vacation. But that's not what this is about. The reason for the big increase comes down to two factors: women and lower income Americans are working more. Since the 1970s, there's been a huge increase in women working outside the home. Many women have also gone from part-time (20 hour a week jobs) to full-time work (40 hour a week employment). "Women are working much more in the market than they used to," says Richard Rogerson, an economist at Princeton University who has studied the changes, especially among married women. Rogerson is quick to point out that it wasn't that women weren't doing any work before, it's just that "they have moved their activity from things which are not generating pay to things generating pay." Overall, men are working just 2% longer hours than they did in 1979. But women's annual hours have gone up almost 20%, according to the Economic Policy Institute analysis. The other key change is that poorer Americans are putting in more hours at work than they did in the past. In 1979, people in the bottom 20% of earners worked about 1,250 hours a year. Today they are putting in 1,500 hours a year. Experts say most of this increase is due to welfare reforms in the 1990s. Benefits were cut and more people were forced to look for work. "People want to work and when they can, they do work," says Lawrence Mishel, president of the Economic Policy Institute. He notes that lower income Americans tend to have less education and have a harder time finding jobs. Sanders is correct that many Americans are working longer hours, at least according to some government data. But are they earning less? Here's the rub: They're earning almost exactly the same. If you adjust for inflation, weekly earnings in 1979 averaged $332 a week. Weekly earnings in 2014 were $334. No wonder Americans feel worse off.